In the final two weeks of The Battle at the Nostradome—Aspire’s data modeling competition to predict glucose levels for diabetes patients—Aspire community members from abroad paid a visit to our Lancaster headquarters to get a little closer to the action. A few members of Team Minsk, from our offices in Minsk, Belarus (naturally), have been working on building the best predictive model for glucose levels along with other projects here in our Lancaster Venture Lab for the past two weeks. Their 8-person team has been keeping the leaders on their heels with some impressive models that earned them 2nd and 3rd place over the past few weeks. 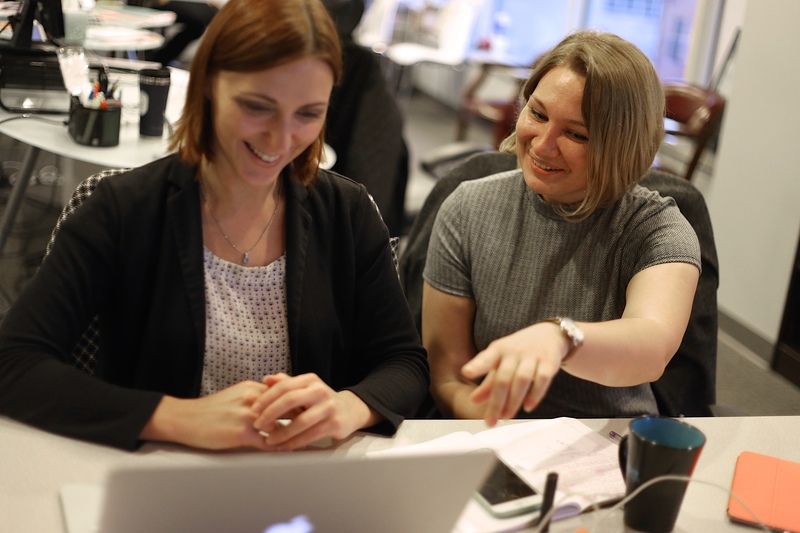 Data Scientists Christina Butsko and Darya Vlasova say they’ve been having fun with the contest. The rivalry with other teams, along with the strict weekly deadlines, has really stimulated progress for their team, they say. Team Minsk has shown continued improvement each week, as have many of the other teams. Now they have something viable, Vlasova says, and most importantly it has shown stable performance over the weeks, which is one of the key factors when assessing a model. They tried a number of approaches, combining factors like basal and bolus insulin injections, carbohydrate intakes, number of steps, and heart rate. Soon they honed in on insulin intakes to predict insulin’s level of decay in the human body. They also tried a new modeling approach, combining a linear model with a nonlinear one. Vlasova thinks that move helped them to finally arrive at a more sophisticated model, one that could potentially be useful for diabetes patients as they plan their insulin regimen. Team Minsk should know all about sophisticated models. Their team was partly responsible for the development of Aspire’s A2i, an advanced search optimization tool that intelligently finds the best parameters for predictive models. It’s a tool that many of our teams have been using to test their own ideas in the competition. Max Reshetilov, Director of Technology at our Minsk office, laid the foundations for A2i when he built a program for optimizing model parameters for Disfa to predict financial markets. Although the platform was built only for one specific sector, Aspire founder Essam Abadir realized that there could be great value in a more generalized version of the tool that could be applied to ventures in any sector. That has been one of the goals of The Battle at the Nostradome, to test whether A2i can truly be applied in a general way to any kind of problem. We’re still assessing results of the past few weeks, but so far teams have found that A2i makes model building a lot easier.